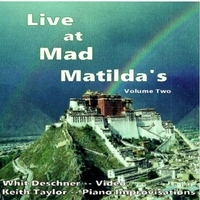 "Live at Mad Matilda's Vol 2" with photography by Whit Deschner and music composed and performed by Keith Taylor (Piano). Keith Taylor was born and raised in Oregon. Even though his parents lived In rural sections of Oregon (his father worked, in sawmills) they provided for his musical education. Taylor began piano lessons at five years of age and was performing and composing music when he was ten. While in grade school he performed on tours with "The Young Oregonians" and "Stars of Tomorrow;" two youth-oriented vaudeville groups. His main contender was Johnny Ray who went on to "The Little White Cloud That Cried" fame. Taylor returned to Oregon to study music at Willamette University and eventually receive a B.M. degree in Piano. Further graduate study included music composition at the University of Oregon and with Halsey Stevens at USC. Taylor received his Master's degree in Composition in 1964 and did additional graduate study in Paris, France. His musical interests were modern in scope, writing and performing atonal and avant-garde music. The music of Anton Webern and John Cage influenced his style. While assisting Cage on several of his concerts and playing the Pieces for Prepared Piano, Taylor wrote rag-type pieces for prepared piano. The following years were spent teaching public school music in Oregon and California. Teaching provided the money and the time to pursue his real interest, composing and playing piano. The major turning point in his career was in 1972 when Eubie Blake played the Stars and Stripes by Sousa. This rag was quickly copied and two more rags, Maple Leaf and Alexander's Ragtime Band were memorized. Taylor was hooked. His performances now included ragtime. Other performers were enlisted to play ragtime orchestrations and sing ragtime songs. The annual "Ragtime In Review" program was initiated at this time. Taylor began playing at festivals from the first festival in Sedalia to the West Coast festivals. Records, cassettes and published music followed. With his conservatory training, he could play any conceivable ragtime style, however, his personal piano styling was not to emerge until the late seventies when he heard performances by Jim Hession. An original ragtime sound was then created, combining the technical aspect of Hession's playing with the atonal or modern structures that Taylor was acquainted with as a composer. This style may be described as "eclectic ragtime,” borrowing music from jazz, pop and classical. Being esoteric in nature, it does not follow the "mainstream" of ragtime but it is highly original.